Credit: Richard Truman, USPHS Public Domain (2014). Transmission of Mycobacterium leprae from armadillos to humans has been shown to occur in the southern United States. However these animals also live in the Brazilian Amazon, where some residents hunt and kill armadillos as a dietary source of protein. It has not previously been proved whether these animals act as a natural reservoir for leprosy transmission in Brazil. In the new work, John Spencer, of Colorado State University, USA, and colleagues in Brazil conducted surveys of armadillos in Pará. 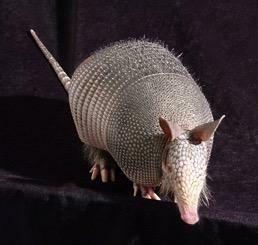 Additionally, people living in the small town of Belterra were surveyed about the extent and frequency of their interactions with armadillos. Levels of leprosy antibodies were measured in the blood of these individuals. DNA was extracted from the spleens of 16 armadillos captured by local hunters. 10 of the animals, or 62%, were infected with M. leprae. Of 146 people surveyed in Belterra, 7 patients were diagnosed with leprosy. In addition, 92 people– or 63% of the population– had positive levels of the leprosy antibody, suggesting exposure to the bacteria. Those who most frequently consumed armadillo meat had higher levels of the antibody than those who least frequently consumed the meat. "Since armadillos occur at very high numbers in many rural areas in Brazil and the new case detection rate in humans has been considered hyperendemic in the Amazon region for a long time, it is extremely likely that the introduction of M. leprae in armadillos due to interactions with infected humans is not a recent event," the researchers say. Funding: This work was supported by grants from Conselho Nacional de Desenvolvimento Científico e Tecnológico (CNPq grant 486183/2013-0 to MBS; 448741/2014-8 grant to Josafá G. Barreto; 481652/2012-4 grant to Claudio G. Salgado; and a Visiting Science without Borders award 402239/2012-1 to JSS), a post-doctoral grant from the Coordenacão de Aperfieçoamento de Pessoal de Nivel Superior (CAPES BEX 6907/14-8 to Moises B. da Silva, and 157512-0 to Barreto), a grant from Bank Santander (Brazil) Amazon 2020 program (to AHHM), CAPES PROAMAZÔNIA 3288/2013, a Fulbright Scholar to Brazil 2015-2016 award to John Spencer, and a grant from The Heiser Program of the New York Community Trust for Research in Leprosy, grant number P15-000827 and P16-000976 (Salgado, Stewart Cole, Mary Jackson, John Belisle and Spencer). Environmental approval of armadillo tissue sampling was obtained by SISBIO/44831-1. The authors thank Heiser, the Colorado State University Libraries Open Access Research and Scholarship (OARS) Fund, PROPESP/UFPA and FADESP for funding the publication cost of this article. The funders had no role in the study design, data collection and analysis, decision to publish, or the preparation of the manuscript.